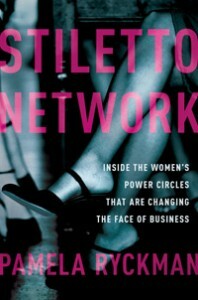 TWE BOOK: Coming to TWE Radio Soon--Pamela Ryckman's "The Stiletto Network"
Stiletto Network–Inside the Women’s Power Circles that are Changing the Face of Business by Pamela Ryckman is about female friendship and the new networks that are forming to band women together to improve their lives and make them more rewarding. Pamela writes about the collaborating circles that are being established to create a just and equal society for women. She gives examples of many of these groundbreaking groups and discusses them on TWE Radio with Stacey Gualandi. You can find out how to start your own network, how they operate and what rewards women are getting from them.